127 Hours is a 2010 biographical survival drama film produced and directed by Danny Boyle. The film stars James Franco, Kate Mara and Amber Tamblyn. In the film, canyoneer Aron Ralston gets trapped by a boulder in an isolated slot canyon in Blue John Canyon, southeastern Utah, in April 2003. Ralston must find a way to escape. It is a British and American venture produced by Everest Entertainment, Film4 Productions, HandMade Films and Cloud Eight Films. The film, based on Ralston's memoir Between a Rock and a Hard Place (2004), was written by Boyle and Simon Beaufoy, co-produced by Christian Colson and John Smithson, and scored by A. R. Rahman. Beaufoy, Colson, and Rahman had all previously worked with Boyle on Slumdog Millionaire (2008). 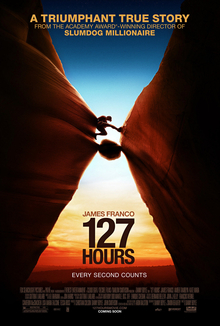 127 Hours was well received by critics and audiences and was runner up for six Academy Awards, including Best Actor for Franco and Best Picture. In April 2003, mountaineer Aron Ralston goes hiking at Utah's Canyonlands National Park. He befriends hikers Kristi and Megan, and shows them an underground pool. After swimming, Aron parts ways with the hikers, and continues through a slot canyon in Blue John Canyon. While climbing, he slips and falls, knocking a boulder which crushes his right hand and wrist against the wall. He calls for help but realizes that he is alone. Ralston begins recording a video diary to maintain morale as he chips away parts of the boulder in an attempt to free himself and tries to keep warm at night. He rations his food and water in order to survive the ordeal. He sets up a pulley using his climbing rope in a futile attempt to lift the boulder. Over the next five days, Ralston tries using his pocket knife to cut himself free, but the blade is too dull to cut bone. With no water available, he is forced to drink his urine. In his videos, he becomes desperate and depressed. He hallucinates about escape, relationships, and past experiences including a former lover, family, and Kristi and Megan. During one hallucination, he realizes that his mistake was that he did not tell anyone where he was going, and decides that destiny has trapped him with the boulder. Using his knowledge of torque, Ralston fashions a tourniquet from CamelBak tube insulation and uses a carabiner to tighten it before breaking the bones in his arm. Using the pocket knife, he slowly amputates his arm. He wraps the stump to prevent exsanguination, and takes a picture of the boulder. He then rappels down a 65-foot rockface using his other arm and drinks rainwater from a pond. He meets a family on a hike, who alert the authorities, and a Utah Highway Patrol helicopter brings him to a hospital. Years later, Ralston starts a family, continues climbing and always leaves a note saying where he has gone. ^ "British Council Film: 127 Hours". British Council. Retrieved 7 December 2016. ^ a b "127 Hours (2010)". Box Office Mojo. Internet Movie Database. Retrieved 31 January 2011. ^ Ralston, Aron (2004). Between a Rock and a Hard Place. New York: Atria Books. p. 326. ISBN 978-0-7434-9282-9. ...before my streak of 127 hours of uninterrupted experience ends at three forty-five P.M., Thursday, May 1, 2003. ^ Yuan, Jada (25 October 2010). "James Franco and Aron Ralston Explain How to Watch 127 Hours Without Fainting". Vulture.com. New York Media LLC. Retrieved 19 August 2018. ^ Barkham, Patrick (15 December 2010). "The Extraordinary Story Behind Danny Boyle's 127 Hours". The Guardian. London. Retrieved 14 April 2011. ^ Between a Rock and a Hard Place, p. 283. "I still haven't uttered even an 'Ow!' "I don't think to verbalize the pain; it's a part of the experience, no more important to the procedure than the color of my tourniquet." ^ Ralston, Between a Rock and a Hard Place, p. 317. "It is mile seven, and a few minutes after three P.M. ... It will kill me if I try to hike out of this canyon. I've lost too much blood; I'm on the verge of deadly shock. I contemplate sending Eric up to get help as well, but before I can spit out the idea, the rapid stutter of a booming echo interrupts my thoughts... Two hundred yards in front of us, the metallic body of a wingless black bird rises over the canyon wall." ^ a b Thompson, Anne (6 November 2009). "Nine Things I Learned at BAFTA's Brittania Awards". indieWire. Archived from the original on 19 June 2010. Retrieved 19 June 2010. ^ Fleming, Mike (4 November 2009). "Boyle, Searchlight Firm Mountaineer Tale". Variety. Reed Business Information. Archived from the original on 9 November 2009. Retrieved 19 June 2010. ^ Jury, Louise (13 August 2010). "Danny Boyle's latest movie boosts London Film Festival". London Evening Standard. Archived from the original on 17 August 2010. Retrieved 15 August 2010. ^ Karger, Dave (12 September 2010). "Danny Boyle & Darren Aronofsky: Toronto Déjà Vu". Entertainment Weekly. Retrieved 27 January 2011. ^ Mitchell, Wendy (5 November 2009). "Danny Boyle plans film about mountaineer Aron Ralston". Entertainment Weekly. Archived from the original on 29 January 2011. Retrieved 26 January 2011. ^ Colin, Robbie (15 November 2009). "Tale of climber who amputated his own arm". News of the World. Archived from the original on 19 June 2010. Retrieved 19 June 2010. ^ Siegel, Tatiana (6 January 2010). "James Franco puts in Hours". Variety. Reed Business Information. Retrieved 19 June 2010. ^ Filmapia.com Movie Locations for 127 Hours. Accessed 19 February 2012. Archived 21 February 2012. ^ Kemp, Stuart (17 June 2010). "Boyle, Daldry to oversee Olympic ceremonies". The Hollywood Reporter. e5 Global Media. Retrieved 19 June 2010. ^ Caranicas, Peter (26 October 2010). "Boyle hikes up number of d.p. 's on 127 Hours". Variety. ^ a b Yuan, Jada. "James Franco and Aron Ralston Explain How to Watch 127 Hours Without Fainting". Vulture. Retrieved 11 April 2016. ^ "James Franco: '127 Hours' Caused Extreme Physical Pain". Huffington Post. 8 February 2011. Retrieved 21 January 2013. ^ "127 Hours". Toronto International Film Festival. 2010. Archived from the original on 27 August 2010. Retrieved 27 August 2010. ^ Brooks, Xan (13 August 2010). "Danny Boyle's 127 Hours to close London Film Festival". The Guardian. Archived from the original on 27 August 2010. Retrieved 27 August 2010. ^ Fischer, Russ (30 July 2010). "Fox Searchlight Sets November 5th Release Date For Danny Boyle's 127 Hours". /Film. Archived from the original on 3 August 2010. Retrieved 5 August 2010. ^ "127 Hours". FilmDates.co.uk. Retrieved 27 January 2011. ^ "Danny Boyle's 127 Hours releases on 26th Jan". IBN Live. 25 January 2011. Retrieved 26 January 2011. ^ "'127 Hours' Causes Fainting, Vomiting, Seizures". Huffington Post. 4 November 2010. Retrieved 21 January 2013. ^ Nemiroff, Perri (7 September 2010). "Danny Boyle's 127 Hours Labeled "Too Intense" After Medics Called to Screenings". Cinematical.com. Retrieved 6 September 2010. ^ Kellett, Christine (15 September 2010). "Audience faints at "realistic" amputation film". The Age. Melbourne. Retrieved 15 September 2010. ^ Finke, Nikki (17 October 2010). "Dial 911 For 127 Hours Screenings". Deadline.com. Retrieved 27 January 2011. ^ VanAirsdale, S.T. (4 November 2010). "Armed and Dangerous: A Comprehensive Timeline of Everyone Who's Fainted (Or Worse) at 127 Hours". Movieline. Retrieved 21 January 2013. ^ "127 Hours Movie Reviews, Pictures". Rotten Tomatoes. Fandango Media. Retrieved 11 January 2018. ^ "127 Hours Reviews, Ratings, Credits". Metacritic. CBS Interactive. Retrieved 7 October 2011. ^ Burchby, Casey. "127 Hours: DVD Talk Reviews of the DVD Video". DVD Talk. Retrieved 14 April 2011. ^ Ebert, Roger (10 November 2010). "127 Hours". Chicago Sun-Times. Retrieved 14 November 2010. ^ Emami, Gazelle (26 October 2010). "HuffPost Review: 127 Hours". Huffington Post. Retrieved 21 January 2013. ^ "The 68th Annual Golden Globe Award". GoldenGlobes.org. 14 December 2010. Archived from the original on 25 December 2010. Retrieved 28 February 2011. ^ "2011 BAFTA Nominees" (PDF). BAFTA.org. 15 January 2010. Retrieved 28 February 2011. ^ "Nominees for the 83rd Academy Awards". Oscars.org. 25 January 2011. Retrieved 28 February 2011. ^ "Broadcast Film Critics Association Awards Nominees". BFCA.org. Archived from the original on 18 August 2012. Retrieved 28 February 2011. ^ "A.R. Rahman wins Critics' Choice award". Chennai, India: The Hindu. 17 January 2011. Retrieved 28 February 2011. ^ "NYFCO Awards 2001-2013". nyfco.net. Retrieved 28 October 2017. ^ "2010". dfwcritics.com. Retrieved 28 October 2017. Wikimedia Commons has media related to 127 Hours.